We have been using David at Sharp Attack for many years for our retail butcher shop needs. As always David is on point with his information and is only too willing to provide his expert advice and assistance. Would not hesitate to recommend David and the Sharp Attack service! Although I had only a brief encounter with Sharp Attack I was more than impressed with how efficient the service is, and how professional and competent Dave Old was. I found Sharp Attack’s products to be above my expectations and I would recommend them highly. I appreciated how convenient Dave was as to personally travel the far distance to maintain the equipment I purchased off him, and I would be more than happy to recommend Sharp Attack to anyone. Sharp Attack installed and commissioned into our Meat Room a Thompson 900 Mixer Mincer, a Thompson MK3 Bandsaw, a Thompson 27kg Sausage Filler, a Viking Bench Vacuum Packaging machine, a Brice Tenderiser and a Brine Pump. This was in July 2009. Before we made the final decisions on what our machinery requirements were, David went through what all of our current and future needs would be and then directed us towards the right machinery. Too small was going to need replacement in the near future and too large was simply going to be an overkill and cost us lots more money. 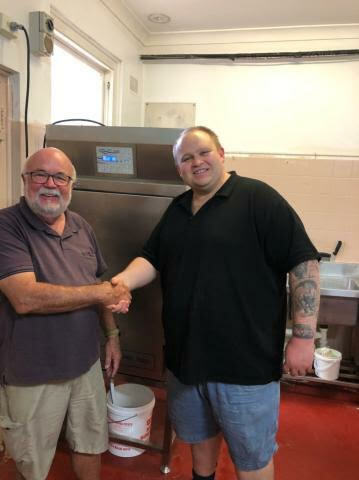 David’s promise to me that not only would he ensure that every machine was installed correctly and working to our expectations, but that he would be there for all future after sales service and questions we may have with regard to the machines. He has been true to his word. Although we are 6 hours south of Brisbane, David has ensured that the correct servicing has taken place and any questions we have had have been followed through. David’s knowledge of meat industry equipment has made us now know that we made the correct decision when we decided to deal with Sharp Attack. I would highly recommend Sharp Attack for any of your future meat machinery requirements. Sharp Attack has been servicing our butchery equipment for many years now and we have always been extremeley happy with the service. We upgraded all our equipment 5 years ago, investing over $50,000, so the Club insists that our investment is protected. We have not had any break downs or major faults since purchasing the new equipment and we put this directly down to the fact that we service it regularly. Not only are breakdowns expensive to repair but it’s also costly in down time, which no one can afford. Our Club’s butchery produces our three restaurants requirements 9serving 400,000 meals per annum) and a retail license that services 14,000 members. I’m sure Brendan (Head Butcher) would be happy to vouch for an discuss any queries that your customers may have. The quality of sales and service we have received from Sharp Attack has always been second to none. In our 53 years in the same business we would only consider our major purchases of equipment from David of Sharp Attack. Not only competitive pricing but always prompt and efficient follow up service and advise. I just recently updated my mince micer sausage filler cuber and slicer. I found David very competitive with his pricing, he also sold me old machinery for me. His after sales and servicing is one hundred percent reliable. I would personally recommend David for any business thinking of updating their machiner. We have dealt with Sharp Attack over many years. Their sales and service has always been executed in a friendly and professional manner. Recently we purchased a Mixer Mincer, Sausage Filler, Bandsaw,Vacuum Packaging Machine, Slicer, Bain Marie and a Sandwich preparation fridge from Sharp Attack. Their pricing was well within our budget and delivery and commissioning was done by David on the date and time that we required. This is the second shop fit-out that we have purchased our machinery requirementss from Sharp Attack. Sharp Attacks after sales service has always been excellent in the past and I can say, with confidence, that we know that this will be done with our latest purchases. I would have no hesitation that and would highly recommending Sharp Attack for any of your future machinery requirements. David’s work has always been perfect when servicing our machinery. Nothing is ever too much of a problem, always willing to help out where possible. I would like to thank you for your services and response times to my requests as well as your indepth knowledge of the products you sell. Being in Chinchilla which is 4 hours form Brisbane, I know it is not easy for you to get here. But you do and parts send without delay. Looking forward to our continued relationship.